"It takes 400 pounds of corn to make 25 gallons of ethanol. This might be a weeks worth of fuel for a person commuting to work. It could be many months worth of food for that same person. You may say that you don't eat that much corn. Actually you do. Dr. Henry Schwarcz at McMasters University in Canada, studies nitrogen isotopes in human bone and teeth. 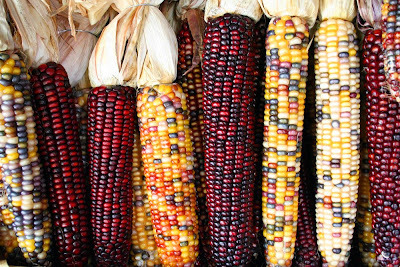 The average north American diet effectively consists of 47% corn! This is because what you eat, eats corn. Beef, Chicken, Pork, Milk, Ice Cream, Butter, Cheese, Eggs, etc. The figure I have seen for beef is six to seven pounds of corn to make one pound of beef. About 30% of the American corn crop is now going to bio fuels. With the number of people in the world (seven billion by 2012), I don't think that this is sustainable." This comment addresses what I think is the number one, increasing problem in the world: the exponential population growth. It's part of the reason I can't get too worked up over the unproven but heavily politicized theory of human-caused global warming. We're far more likely to run out of resources before climate change becomes a real problem; and by resources I mean food. Name a farming area that's growing, rather than shrinking. Well, other than the Amazon Basin, but even leaving aside the real concerns about the loss of wilderness area and its oxygen production, the Amazon Basin is big, but not big enough to feed the world. 110 mpg, 400 hp Mustang?